You'll be £10.00 closer to your next £10.00 credit when you purchase Commando General. What's this? Always marked out for high rank, Robert Laycock came into his own when selected to raise 8 Commando, a new ‘crack’ unit early in the Second World War. After training, 7, 8 and 11 Commandos were sent to the Middle East in early 1941 and all became Layforce under Laycock’s command. Layforce was disbanded after Crete fell. Laycock took part in the abortive raid on Rommel’s HQ. As commander of the Special Service Brigade Laycock played an important role in the Sicily landings and at Salerno. In October 1943 he succeeded Mountbatten as Chief of Combined Operations, coordinating combined services operations and training and attending Allied conferences. In later life Laycock became Governor of Malta and Colonel of the SAS. In this long overdue biography, the author reveals the detail of this fine soldier’s character and superb military record. Mead, who has also written biographies of General Richard McCreery and General ‘Boy’ Browning, has produced in Commando General another fine study of a previously biographically neglected British general of the Second World War. Richard Mead's Engrossing and overdue biography of Britain's youngest wartime major general highlights a charmed career without pulling punches on those episodes altogether more conscientious and controversial. It seems extraordinary that only now, six decades after the Second World War is there a biography, one well worth waiting for, of Major General Sir Robert Laycock KCMG, CB, DSO. This book has considerable merits, not least the effective use of extensive private archives and is well written. 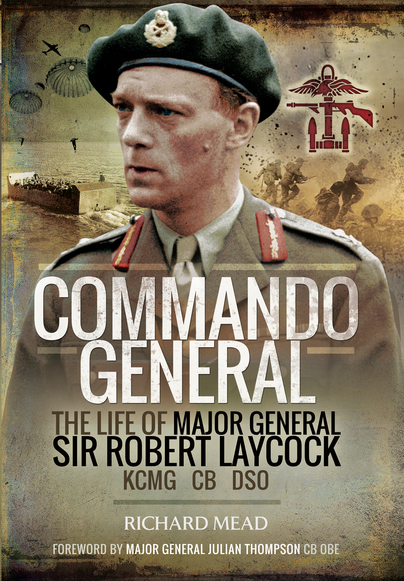 Richard Mead's excellent biography Commando General tells Robert Laycock's story from his time as a schoolboy at Eton through to his tenure as Governor of Malta in the late 1950s. I have other books written by the same author, which I have enjoyed and found to be informative, so I was looking forward to reading this biography. I was not disappointed. LAYCOCK was a soldier of whom I had come across with my military reading and research, but I knew little about his actual life, or the role he played in the British Army during the Second World War. This biography is to a large part, the history of the Army Commandos during the war. LAYCOCK was involved in the beginning with the raising of the first commando units, rising to Head of Combined Operations by 1945. The author has woven with skill the political and military strategic issues around the deployment, and development, of the commandos, with the personal life of LAYCOCK and the more tactical side of the operations. The level of research is excellent, with the book based upon interviews with relevant people, primary and secondary research. The bibliography is very useful to any military historian interested in the commandos. There are twenty-three chapters covering the entire life of LAYCOCK, with individual chapters on Layforce, Bardia and Crete, as well as operation Husky (the invasion of Sicily) and Avalanche (Salerno). There are four maps, and a good selection of photographs, both personal and military, in the centre of the book. In conclusion, the author has provided what I consider to be a balanced, well researched, and informative account of the life of Bob LAYCOCK, and the instrumental role he played in the development of the commandos. I enjoyed the book, I hope you do. Laycock and the development of British Special Forces during WWII. Sir Robert Laycock, usually known as Bob, has arguably not received as much attention from military historians as he deserved; the publication of Richard Mead's biography is therefore welcome. Commando General would be the perfect present for anyone interested in the Second World War, in the origins of the Commandos or in Evelyn Waugh, who was Laycock's friend, admirer, staff officer and who features frequently in the narrative. The book is well-written and spiced with dry military humour.